The (unintended) symbolism in the cooperation between Suzhou and Singapore: the old learning from the new, the master from the student, the cultured from the unsophisticated, is not without a bit of irony and has an intrinsic “un-Asianness” in it. Yet in some very mystic way it has become a motif in the China-Singapore relationship. Preface: The Suzhou Declaration on International Co-operation for the Safeguarding and Development of Historic Cities (1998) was adopted by the International Conference for Mayors of Historic Cities in China and the European Union, Suzhou, China, 7-9 April, 1998. Mayors and representatives from 15 historic cities in China, and seven in Europe met in Suzhou, China, April 7 – 9, in a conference convened by UNESCO World Heritage Centre in co-operation with the Chinese Ministry of Construction, and the City of Chinon (France) and adopted a 13-point Suzhou Declaration for the preservation and development of historic cities. More than 125 experts and local authority representatives attended the International Conference of Mayors of Historic Cities in China and the European Union which received support from the Chinese and European authorities and was financed by French group L’Oréal. They discussed a wide range of topics from the preservation of historic urban morphology, to the social and economic development of historic cities. Towns represented included 12 World Heritage cities: Barcelona, Bath, Beijing, Chengde, Lhasa, Lijian, Naples, Pingyao, Qufu, Suzhou, Venice, and Visby. In their Declaration, the mayors undertook to develop, in their respective cities, effective conservation policies to preserve historic urban districts, both because these districts retain the collective memory of culture and because such districts provide the inhabitants with a sense of continuity of civilization on which sustainable social and economic development is based. The Declaration also underscores the importance of creating legislative frameworks for the protection of the authenticity of historic districts and the need for local policies which encourage the adaptive re-use of historic buildings for various public and private purposes, including for social housing and support facilities such as schools and hospitals. The mayors concluded by calling for cooperation between the public and private sectors and private sector participation in efforts to safeguard the urban heritage of local communities everywhere. The meeting was held against the background of massive urbanization world-wide which is threatening the survival of the cultural heritage of humankind. Given the increasingly important role of mayors and local authorities, as well as civil society, in the effort to conserve and develop historic cities, the Mayors Conference set the stage for international cooperation to safeguard the world urban heritage for the 21st century. In addition to technical, economic, and financial measures, an effort to increase legislation, improve planning and raise the public’s awareness of protection should be taken to guarantee the continuity of different cultures in historic areas, said the Suzhou Declaration on International Co-operation for the Safeguarding and Development of Historic Cities, which was signed on Thursday at the International Conference for Mayors of Historic Cities in China and the European Union. During the meeting in Suzhou, L’Oréal contributed RMB 200,000 (approximately US$24,000) for the safeguarding of the city’s four classical gardens which were inscribed on UNESCO World Heritage List in 1997. The peoples and countries of the world have always loved their history and the land they have lived on for generations. Indeed, the prevalence of such feelings would seem to indicate that they respond to something most basic in human nature. But another most-human feeling is hope in a better future. We look back and we remember our forebears; we look forward and hope that our children will have a better life than we had. In the century now about to come to a close, many began to realize that there are certain manifestations of nature or culture that really evoke or express something so profoundly human that they deserve to be preserved for all humanity. A milestone in such awareness was reached at the time the decision was made to build the Aswan High Dam in Egypt, which would flood the valley containing the Abu Simbel temples, a treasure of ancient Egyptian civilization. After an appeal from the governments of Egypt and Sudan, the United Nations Educational, Scientific and Cultural Organization (UNESCO) decided to launch an international campaign. Archaeological research was accelerated and the Abu Simbel and Philae temples were dismantled and reassembled on dry ground. This international effort — some 50 countries made donations — underscored the importance of nations” shared responsibility in conserving outstanding cultural sites. Its success led to other such campaigns, and the preparation of an international convention. The convention is a recognition of shared responsibility. States Parties are invited to nominate sites within their territory for inclusion on a World Heritage List, and then to report on the state of con- servation of such sites. UNESCO helps countries by providing technical assistance and professional training, and by providing emergency assistance if it should unfortunately be needed. The convention has two basic principles. First, each State signing the convention recognizes that it has the main responsibility for safeguarding world heritage located in its territory and undertakes to do so, to the utmost of its own resources. Secondly, the states recognize that it is the duty of the international community as a whole to ensure the conservation of all heritage that is universal in character. Over the years, countries have also insisted that the preservation of heritage must be harmonized with social and sustainable economic development. As readers of China Today know, China has been an active participant in this process. The Chinese Government, in recognition of the growing need for the conservation of nature and natural resources, initiated a network of reserves in 1956. The original list of 40 protected areas has since grown to nearly 400. In regard to cultural property, the 1961 Provisional Regulations on the Protection and Control of Cultural Relics evolved into the 1982 Law on the Protection of Cultural Relics. In 1985, China ratified the UNESCO convention and started to nominate sites to the World Heritage List. Today 15 cities in China are included on the World Heritage List: Chengde, Hangzhou, Harbin, Kunming, Lhasa, Lijiang, Luoyang, Nanjing, Beijing, Pingyao, Qufu, Suzhou, Xi”an, Xiangfan and Zhenjiang. China has thus committed itself to preserving the historical treasures of these places in order to share them with all humanity, to keep alive a part of our collective awareness for the future gene- rations of the world. And the rest of the world has recognized that these Chinese cities contain elements of fundamental human value, expressions of collective genius that deserve to be preserved by a corresponding collective effort. Thus, the world’s attention has been called to the Mountain Resort of Chengde; Harbin’s Central Pedestrian Street and Saint Sophia Church; the Green Lake and Yuantong Hills district of Kunming; the Old Town of Lijiang; Luoyang’s Old Town of the Song and Jin dynasties; the temples of Pingyao; Qufu’s Confucian complex; the Cishou and Iron Pagodas in Zhenjiang; and of course, the treasured gardens and urban, canal-crossed landscape of Suzhou. Quite clearly, many historic neighborhoods and buildings are in cities — the growing, expanding, changing urban centers so unlike the old civitas that lent its name to the citizens who inhabited them. Today urban explosion poses a real challenge, especially in Asia, as UNESCO director-general Federico Mayor has explained. In the next 25 years, Asia’s urban population is expected to double, and half the planet’s urban areas and more than a third of its population will be in Asia. UNESCO has launched a Program for the Safeguarding and Development of Historic Asian Cities for the 21st Century. As an integral part of this effort, the first International Conference for Mayors of Historic Cities in China and the European Union was held in historic Suzhou, Jiangsu Province ” an apt site since it was an early point of Chinese-European contact in the time of Marco Polo and the Yuan Dynasty. 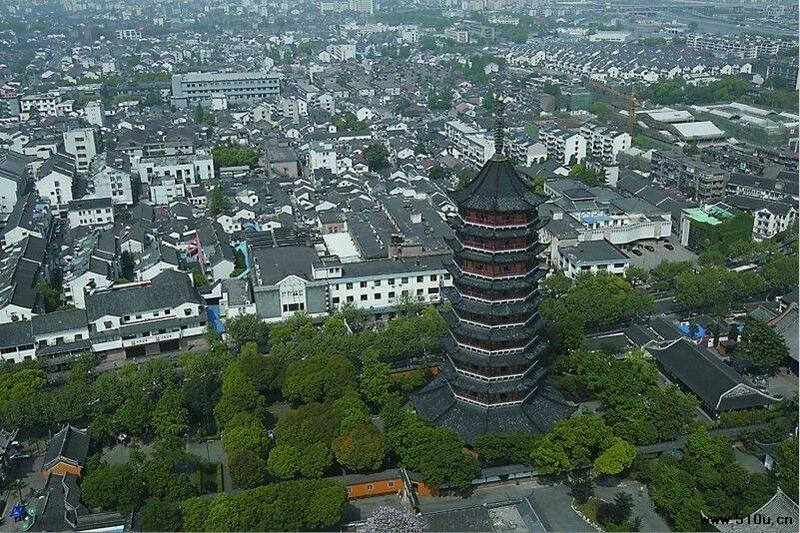 Jointly organized by the Chinese Ministry of Construction, The World Heritage Center and the cities of Suzhou and Chinon (France), the meeting brought together the mayors of all 15 Chinese cities that are on the World Heritage List and those of another 8 from Europe. With the added presence of experts in conservation, arch- itecture and urban planning, the 3-day event was a true forum for the exchange of ideas and experience, and was culminated by the signing of the ‘suzhou Declaration,” which marks new progress in un- derstanding how to combine the desire to preserve our heritage with the needs of sustainable de- velopment in order to improve the lives of citizens. The declaration addresses such issues as the integration of historic districts and the modern city; the preservation not only of individual buildings but of whole districts and the traditional urban fabric; full public participation in heritage conservation; and programs of public/private partnership in the implementation of policies. The declaration closes with a pledge to develop programs of cooperation between Europe and China, especially decentralized cooperation between local authorities of China and the European Union, and to eventually extend such cooperation worldwide. The participants also had a chance to experience the renowned hospitality of the people of China. The local authorities planned informative and interesting visits to some of Suzhou’s many wonders, and this was one time that the ‘social” program was an integral part of the conference . The mayors got to witness how the city is rebuilding one of its old neigh- borhoods in the same style and on the same scale it used to have; how it is restoring one of its old temples; how it helps preserve living traditions at its embroidery museum; and how well it has pre- served its magical gardens. Many compliments were heard about the work Suzhou has done and is continuing to do to pass on a remarkable past to its future generations of citizens. But the author will retain one image above all others. The people of Suzhou invited us one night to enjoy traditional music in the 200- year-old Master-of-Nets Garden. There, next to a pond and under a light rain, I sat under a gazebo and listened to a short reed-flute solo. The moon was not visible but I could feel its presence — how many times had its image been reflected in the pool at my feet? At such a moment the world takes on a new shape — larger, more varied, with many paths crossing and leading to yet-to-be-discovered opportunities, with even the rain a blessing. Here there are no strangers but only friends to be made. This, for me, is the embodiment of a heritage shared. Heritage Europe was formed as “The European Association of Historic Towns and Regions” by the Council of Europe in October 1999 as part of the initiative “Europe – A Common Heritage”. Heritage Europe now represents through its range of membership categories over 1000 historic and heritage towns, cities and regions in 30 European countries. International co-operation between heritage organisations, and historic towns, cities and regions. Sharing experience and good practice between historic towns, cities and regions. Promoting vitality, viability and sustainable management of historic towns, cities and regions. cultural heritage does count for Europe’s sustainable development. Heritage Europe and partners of the EU-funded project ‘Cultural Heritage Counts for Europe’ (CHCFE) coordinated by Europa Nostra have published the main findings and strategic recommendations for tapping into heritage’s full potential by providing compelling evidence of the value of cultural heritage and its impact on Europe’s economy, culture, society and the environment. The project’s key findings and recommendations were presented by Heritage Europe’s Secretary General Brian Smith on behalf of the project partners at the CHCFE concluding conference held on 12 June at the University of Oslo and organised in conjunction with Europa Nostra’s Annual Congress 2015. The International Conference for Mayors of Historic Cities in China and the European Union, Suzhou, China, 7-9 April, 1998. It underscores the importance of creating legislative frameworks for the protection of the authenticity of historic districts and the need for local policies which encourage the adaptive re-use of historic buildings for various public and private purposes, including for social housing and support facilities such as schools and hospitals. Considering the importance of the preservation of historic cities and the national and international responsibilities under the World Heritage Convention, given the necessity to disseminate information, the participants of the International Conference for Mayors of Historic Cities in China and the European Union focused their attention on the reconciliation of the preservation of historic cities with social requirements and economic development and the need to find solutions or options for the future in accordance with the principles of sustainable development. The mayors or their representatives from 15 Chinese and 7 European Union cities met in Suzhou, China, from 7 to 9 April 1998. The participants reaffirmed the commitment made by the national authorities of their respective countries to the Convention concerning the Protection of World Cultural and Natural Heritage (World Heritage Convention) and recalled the Recommendation concerning the Protection at National Level of the Cultural and Natural Heritage, both adopted on 16 November 1972 by the General Conference of UNESCO, and the Recommendation concerning the Safeguarding and Contemporary Role of Historic Areas, adopted on 26 November 1976 by the General Conference of UNESCO, and the Recommendation concerning the Preservation of Cultural Property Endangered by Public or Private Works, adopted on 19 November 1968 by the General Conference of UNESCO. The participants recalled furthermore Agenda Twenty One of the Earth Summit held in Rio de Janeiro on 1992 and the Habitat Agenda of the City Summit-Habitat II held in Istanbul in 1996 and noted the Action Plan on Cultural Policies for Development adopted by the Intergovernmental Conference on Cultural Policies for Development held in Stockholm on 2 April 1998.
develop programmes of co-operation to implement these policies, and for this purpose, to seek with UNESCO, the European Union and others, the support of their respective national as well as regional authorities and other entities to develop projects of decentralized cooperation between the local authorities of China and those of the European Union and opt to enlarge this agreement by inviting the participation of other Chinese and European cities and countries throughout the world.